Or check out our testimonials and more information about us below. I have to say, I truly did not expect that I would get such a service for modest amount of money I paid. The team that came to clean my office the other day was properly equipped and was clearly well-trained in the trade. I was even able to continue working on my latest project, since they somehow managed to do their job peacefully and quietly. Although my spring cleaning budget this year was anything but big, I felt that I got premium quality services with you. The cleaners were very friendly and polite. They were even kind and patient enough to give me a few cleaning tips of which I am already making the most. I am definitely going to call you again and recommend you to all of my friends. Last Friday, when we were about to move of our old apartment, our landlord surprised us in the most unpleasant way possible by handing us a long end of tenancy cleaning list. We were already too busy moving our staff so we decided to call you guys. We must say we were incredibly happy with the job you did for us. You managed to help us despite the short notice. 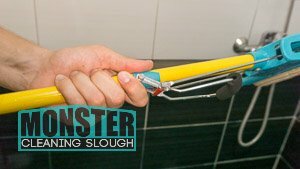 We are confident that Monster Cleaning Slough is among the most renowned and experienced cleaning companies in Slough, since we always enjoy excellent reviews from our clients and work with a team of seasoned and skilled experts. The equipment and supplies in which we have invested are of a premium quality which enables us to provide thorough and comprehensive solutions for our customers. As for our prices – they are unmatched in their affordability. The biggest advantage we can offer you is flexibility in terms of our schedule, rates and services. Our trained and vetted staff can be booked on national holidays and weekends. If you are too busy at work and do not want us to be in your way, we can come to your office after regular business hours. The quotes we offer are personalized and are based on your wishes and financial capacity, which means you will not spend more than you want to or pay for things you do not need. The scope of each of our services can be adjusted and customized in a way that will better satisfy your needs and match the character of the project and the results you expect. End of tenancy cleaning – last-minute solution for tenants who are moving out of their home. Our team will cross off all tasks in your checklist in a fast and well-organized way, allowing you to focus your attention on your relocation. Domestic cleaning – all-round service that can be booked regularly at a low price. We have the experience and the capacity to wash, vacuum, mop and scrub every inch of your property regardless of whether it is a studio flat or a large house. Oven cleaning – focuses not only on ovens, but on all types of cookers (grills, hotplates, BBQs, microwaves and etc.). Suitable for household, café and restaurant cooking appliances. Carpet cleaning – available for carpets of all types, materials and sizes. We have the equipment to provide dry and steam cleaning solutions, as well as to offer stain proofing treatment that will prolong the life of your carpeting. One-off and spring cleaning – offered at a very competitive cost for private, business and commercial customers. Get a comprehensive solution for a starting price of barely £12.5 per cleaner per hour (price does not include cleaning materials). After builders cleaning – reliable way to take control over the chaos after a renovation or construction job in your home or office. We will send you our most experienced professionals who will quickly restore the shine of your property. Office and commercial cleaning – comprehensive service that will not disturb your workplace environment. Regular and one-time visits are available at a moderate price. Our punctual cleaners can be booked at a time that is most convenient to you. Monster Cleaning Slough has one of the most affordable prices in all SL areas. If you need regular cleaning services, make sure you hire us and you will enjoy very competitive rates. Book us for 2 hours a week and pay prices starting at £11 per cleaner per hour. Hire us for 3-5 hours per week and the starting price drops to £10. Any booking that exceeds 6 hours per week is available with a price tag from only £9. This pricing is valid for both private and business clients and can be easily combined with our amazing deals in case you wish to save more money. Monster Cleaning Slough is one of the most sought-after cleaning firms in Slough. We have remarkable coverage of all SL areas and we are not afraid of challenges. We are confident our clients appreciate these qualities of ours, based on their feedback and reviews. Get in touch with us!